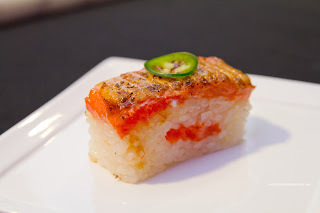 I'm sure you've all heard of Dine Out Vancouver, where we see many of the best restaurants in town offer up set meals for a reasonable price. 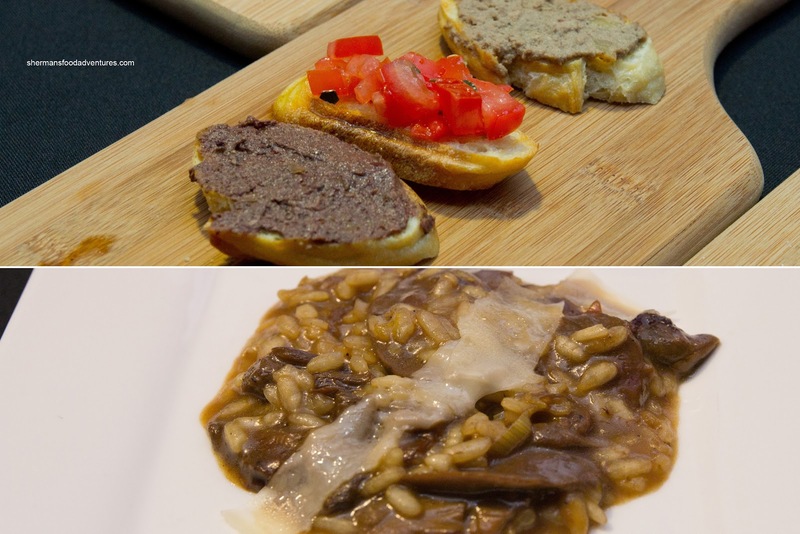 However, there are smaller localized versions such as the Taste of Yaletown. Running from October 17th to October 27th, many Yaletown eateries are offering $25, $35 and $45 three-course meals. 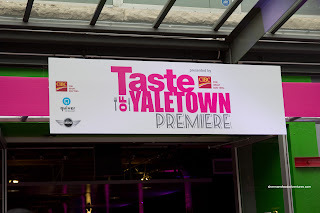 As part of their official festivities, I was invited to their Taste of Yaletown Premiere Event at Yaletown Mimi. 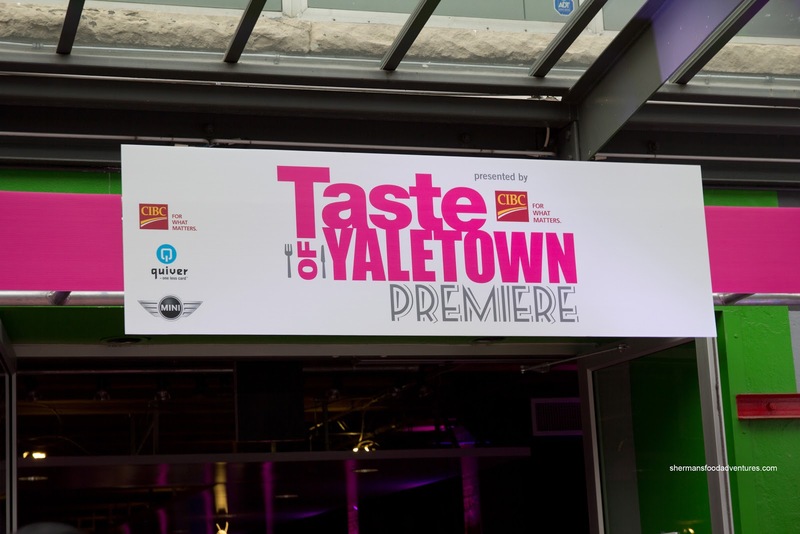 Nine restaurants which included Caché Bistro & Lounge , George, Glowbal Grill Steaks & Satay, Hamilton Street Grill, killjoy, Minami, New Oxford, Society and Yaletown L'Antipasto participated in this tasting event to officially launch the Taste of Yaletown. Joining me as a guest was Whipping Girl, who loves food apparently. So much so, she had a wrap from Mangal Kiss less then 2 hours before the event. That's not strategic eating! Anyways, many of the vendors were just setting up as we arrived, yet that didn't prevent us from hitting dessert. We sampled the Cherry Cotton Candy Cheesecake from Society first. It was nicely plated with a good amount of sour cherries on top, yet the crust-to-cheesecake ratio seemed to be way off. To be fair, this was a tasting portion and the actual slice of cheesecake is much more balanced. Then we tried the Canadian Rib Eye Medallion on nicely caramelized roasted root vegetables. The slice of rib eye was perfectly cooked and super moist. The Café de Paris butter on top was a little too generous for the cut of beef, but again, this was a sampling size. Lastly, we had the Mac Poutine which consisted of a fried stick of mac n' cheese served with mozzarella and gravy. It reminded me of the fried mac n' cheese balls at Cheesecake Factory, except with cheese and gravy. Moving next door to Hamilton Street Grill (literally, since they are really located near door to Yaletown Mini), we had something that, at first, didn't look too promising. It was a Bison Flat Iron Steak with Tomato Jam on a crostini. However, the whole thing was really flavourful and texturally pleasing. 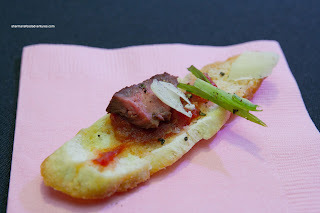 From the moist bison, sweet and tangy jam, to the crispy crostini, this was a surprisingly tasty bite. 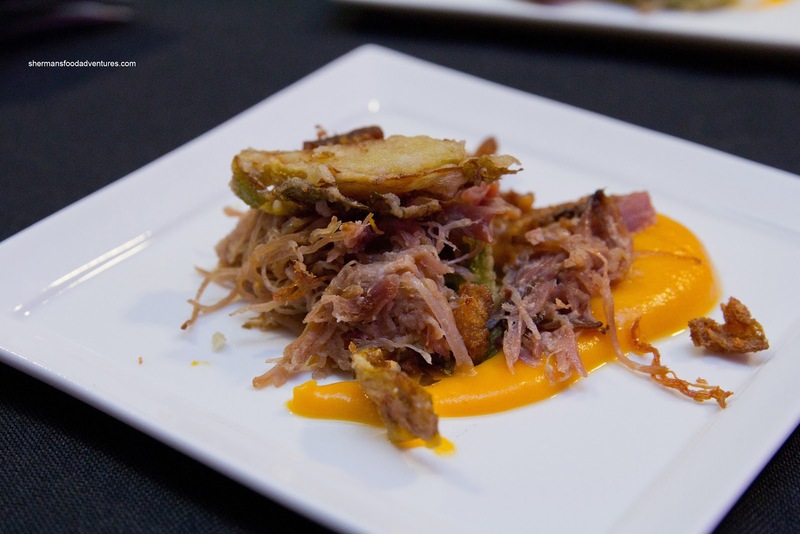 Heading down to George (an extension of Brix), we tried their Crispy Duck Confit with smoked local butternut squash & sweet potato puree and truffled brussel sprouts. This was a very well-composed dish with tender shredded duck, cracklings and yummy fried brussel sprouts. The sweet puree was a nice counterbalance to the savouriness of the dish. A combo effort between The New Oxford and killjoy resulted in a dish of Yukon Gold Potato Ravioli and Marinated Olives & Pickles. 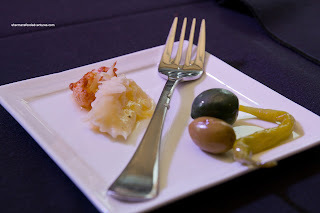 The fluffy ravioli was nicely accented by Pecorino Romano and browned cauliflower. The table with the biggest gathering was Minami, the new sister restaurant to Miku. Why? 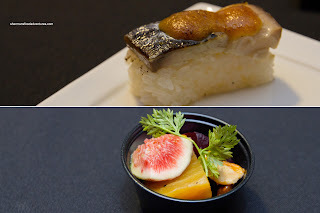 Well, they were serving their signature item being the Aburi Salmon Oshi. What can I say about this little tasty morsel that has not been said already? They also had a Pressed Makerel with seared miso sauce. Good, but I preferred the salmon more. There were also little cups of the Beet Salad with yuzu-creme fraiche, fig and candied cashew nuts. Pretty good, except the creme was quite thick. 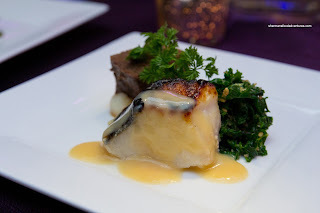 The award for the most substantial dish went to Minami with the Saikyo Miso Sablefish, Soy-Brasied Angus Shortrib with Yukon potato puree & wasabi pickles and Kale Gomaae. The sablefish was perfectly cooked being moist, buttery and flaky. The miso was not overbearing which let the fish shine. We really liked how they were able to make the kale super tender (which can be difficult). It was dressed in a aromatic roasted sesame dressing which was devoid of the dreaded sweetness. As for the shortrib, it was not as moist as we would've liked, but the wasabi pickles really added a welcomed spice and tanginess. Right next to Minami was Yaletown L'Antipasto. They were serving up Bruschetta Mista consisting of olive pate, tomato & basil and chicken liver pate. There was nothing amiss here with the classic tomato being the highlight. There was also freshly made Risotto with Porcini Mushrooms. By trying to ensure that the arborio rice was not overcooked, they undercooked it instead. Therefore, the rice was slightly hard while the sauce was not that creamy. I did like the flavours though as the mushrooms really stood out. 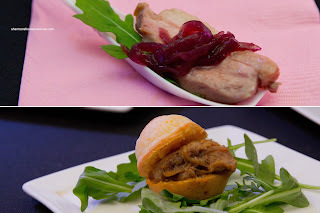 Lastly, at Caché, there was Duck Breast with red onion jam. I thought the duck fat was not rendered enough while the flavours were too mild. However, their other offering, Pulled Pork on mini corn bread sliders was fantastic. The bread was soft while the pork was moist and really flavourful. So there you have it. 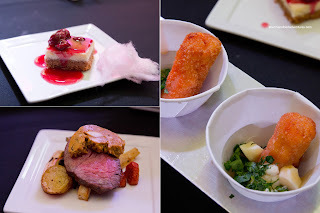 A preview of what to expect out of the Taste of Yaletown. Now go eat something.